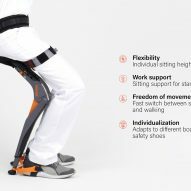 This flexible exoskeleton, designed by Swiss studio Sapetti, allows its wearer to sit down whenever and wherever they need to. The Chairless Chair is designed primarily for manufacturing environments, where workers are required to stand for long periods of time and where traditional chairs would be an obstacle. 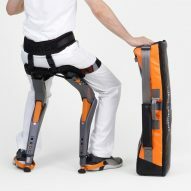 The wearable exoskeleton allows users to walk around freely but have instant support once they get into a bending, squatting or crouching position. This would reduce the number of instances where employees feel physical strain, so could potentially reduce absences and early retirement. 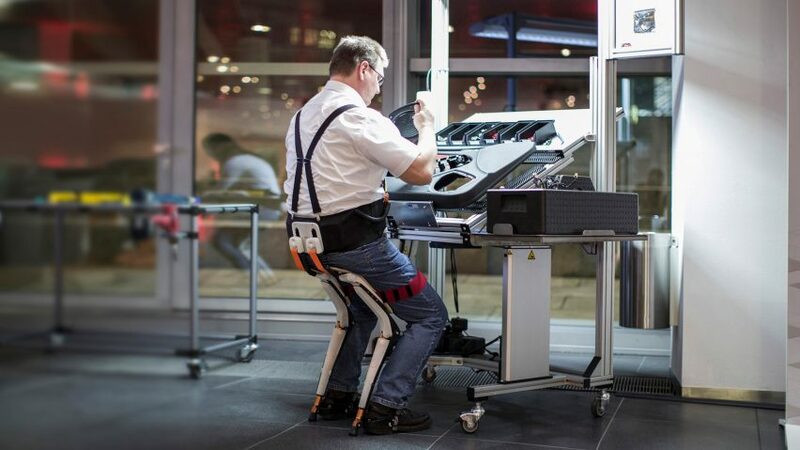 Sapetti designed the Chairless Chair for Swiss company Noonee, which describes itself as the world's first supplier of "wearable ergonomic mechatronic devices". The chair is its first product. "With the Chairless Chair, Noonee's clients can not only improve the ergonomic environment for their employees, by improving body posture, but also solve and prevent certain occupational health and safety challenges, and provide age-appropriate working conditions for their ageing employees," said Sapetti founder Marc Sapetti. The chair frame can be adjusted to suit people of different heights and girths, and it can also be fitted to various work-safe footwear. 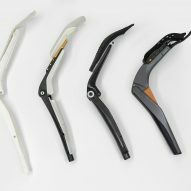 It is made largely of engineering plastics like polyamide, chosen for their light weight and durability. Sapetti developed the product over two years, together with engineers Zuhlke. The designers worked closely with employees of auto companies Audi, Seat, Skoda, Daimler, BMW and Renault to understand the needs of workers on the factory floor. 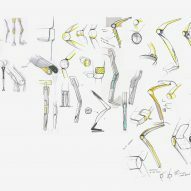 The possibilities of exoskeletons – or frames worn on the outside of the human body – as a form of aid and enhancement are being widely explored by designers and engineers. Most efforts so far have focused on people with limited mobility. In 2014, American 3D-printing firm 3D Systems created a robotic suit that helps paralysed patients stand and walk, while earlier this year, Yves Behar revealed the Aura Power Clothing, which is fitted with "electric muscles" to assist the elderly with movement like climbing stairs. Others have looked to give humans super-strength, with students from the University of Pennsylvania winning the James Dyson Award in 2013 for a strap-on robotic arm that gives its wearer the ability to lift an additional 18 kilos.